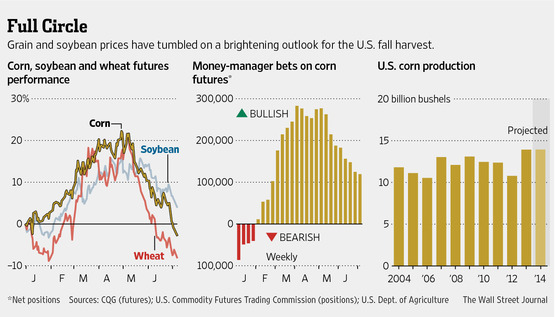 “Corn for July delivery, the front-month contract, fell 7.75 cents, or 1.9%, to $4.0925 a bushel, the lowest closing price for a front-month contract since Aug. 25, 2010,” today’s article said. In related news, Purdue University agricultural economist Chris Hurt indicated yesterday at the farmdoc daily blog (“Pork: USDA Reports Help Brighten Outlook”) that, “Pork producers might want to say thank you for the recent USDA reports that have sharply brightened their profit outlook. The first of those was the June 27th Hogs and Pigs report indicating that breeding herd expansion had not yet started and that baby pig death losses from the PED virus continued to be high last spring. The second beneficial numbers came in the June 30th Grain Stocks and Acreage reports which were contributors to rapidly falling corn and soybean meal prices. More broadly, Neil Irwin reported on the front page of today’s New York Times that, “Welcome to the Everything Boom — and, quite possibly, the Everything Bubble. Around the world, nearly every asset class is expensive by historical standards. Stocks and bonds; emerging markets and advanced economies; urban office towers and Iowa farmland; you name it, and it is trading at prices that are high by historical standards relative to fundamentals. The inverse of that is relatively low returns for investors. And Lawrence H. Summers indicated yesterday at The Wall Street Journal Online that, “What has happened in agriculture over the past century is remarkable. The share of American workers employed in agriculture has declined from over a third a century ago to between 1% and 2% today. Why? 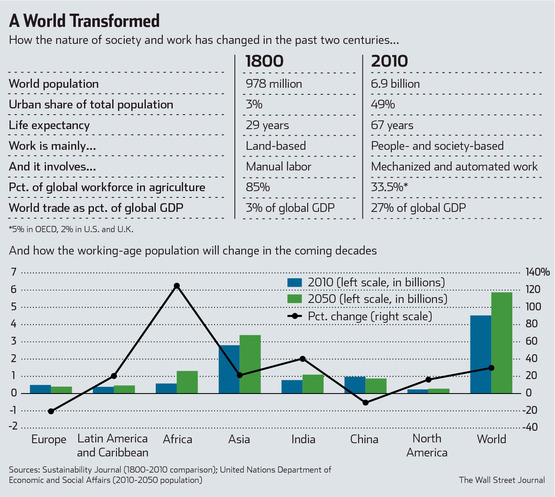 Because agricultural productivity has risen spectacularly, with mechanization reducing the demand for agricultural workers even as food is more abundant than ever [related graph]. 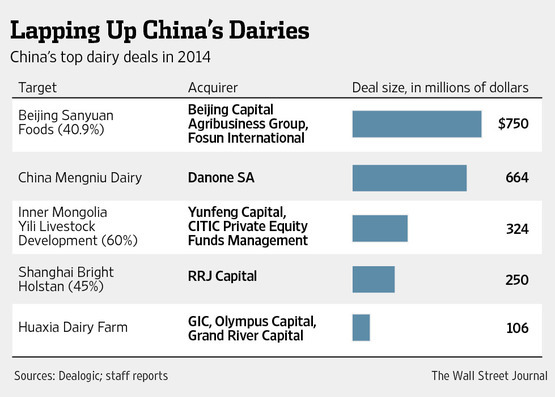 Isabella Steger reported yesterday at The Wall Street Journal Online that, “A renewed push by the Chinese government to consolidate the country’s dairy industry could spur a round of deal making and capital raising in the sector [related graph]. In other news regarding China, Shawn Donnan reported earlier this week at The Financial Times Online that, “Ever since China joined the World Trade Organisation in 2001, the criticism from the US and other major powers has been remarkably uniform: China is doing too little to advance the cause of global trade liberalisation and when the tough negotiating starts Beijing hides behind other developing economies. Mr. Kane explained that, “It is the Senate that has become the derailment site in fiscal negotiations. “The Senate Appropriations Committee, under the feisty direction of its chairman, Sen. Barbara A. Mikulski (D-Md. ), had churned out enough of its funding bills that [Senate Majority Leader Harry M. Reid (D., Nev.)] initially cobbled together three of them [including agriculture] for consideration in late June. The full House of Representatives has still not voted on the agriculture appropriations measure. In more detailed reporting on the ag appropriations bill, AP writer Darlene Superville reported over the weekend that, “First ladies typically avoid getting into public scraps, but Michelle Obama has jumped into perhaps her biggest battle yet. Ms. Superville explained that, “A House bill to fund the Agriculture Department next year would give districts a chance to apply to skip the requirements for one year. “Rep. Robert Aderholt of Alabama, the Republican author of that measure, said the lunch rules go too far and came too fast for school districts to handle. On the issue of nutrition, Laura Tiehen stated in a recent Amber Waves article that, “The Nutrition title of the Agricultural Act of 2014 reauthorizes USDA’s Supplemental Nutrition Assistance Program (SNAP), the Nation’s largest food and nutrition assistance program. In fiscal 2013 (October 2012-September 2013), an average of 47.6 million people received SNAP benefits each month, and Federal spending for the program totaled $79.8 billion, accounting for over half of USDA outlays in that year. In contrast with many other programs serving low-income households, SNAP eligibility does not depend on family structure, age, or disability status, so benefits reach a broad range of needy households. The ERS article added that, “In 16 States and the District of Columbia, nominal LIHEAP [Low-Income Home Energy Assistance Program] payments (typically $1 to $5 per year) have been issued to trigger additional SNAP benefits for some households. The practice is known as adopting a ‘Heat and Eat’ policy, a term coined by advocates to bring attention to the choices faced by low-income households trying to stretch scarce resources to cover energy and food expenses. Under the Heat and Eat policy, some States have issued nominal LIHEAP payments to allow some SNAP recipients to claim the HCSUA [heating or cooling standard utility allowance], even though their heating and cooling expenses are included in their rent. More information on USDA’s Summer Food Service Program can be found here. A recent AFP article by Eric Randolph stated that, “While the United States, Canada, Brazil, Argentina and China and many other countries have warmly embraced genetically modified crops, Europe remains the world’s big holdout.